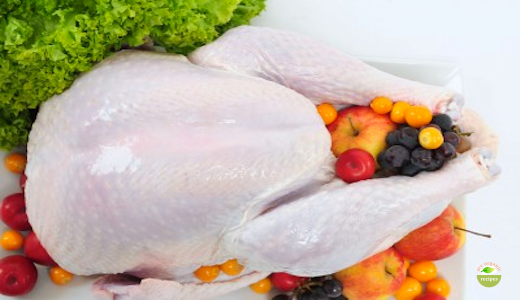 Turkey is a good source of protein, has some nice minerals such as potassium and is low in calories. 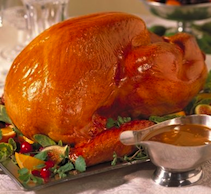 Turkey is also law in fat and most of the fat it does have is either monounsaturated or polyunsaturated. Enjoy the roast turkey for Thanksgiving. Wash very well the turkey and seasoned with salt and pepper. Set aside. In a bowl mix the butter,egg yolks,sugar,bread,bread crumbs,egg whites (mixed very well) and chestnuts. Fill the turkey with the mixture.Skewer turkey neck skin to back of turkey. Tuck ends of drumsticks under band of skin across the tail or into wire or nylon leg clamp. If there is not skin or clamp, tie drumsticks to the tail with clean 100% cotton kitchen string. Twist wing tips under the back of turkey. Place turkey, breast side up, on a rack in a shallow roasting pan. Brush with the melt butter and bacon. Roast turkey for 2 ½ hours and drizzle with brandy and continue roasting for 30 45 minutes.Remove turkey from the oven , let stand 15 minutes.